Caraka Samhita is an authoritative text on Ayurveda, held in high esteem and being studied since many centuries in India. 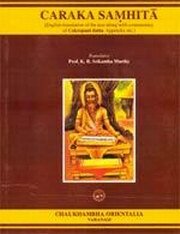 Its importance is great since it describes briefly in its 120 chapters, all the basic doctrines of Ayurveda. Some such doctrines are - Lokapurusasamya - (man a microcosm) -Pancamahabhuta (five primary elements). Ayuhbheda (kinds of life) dosa-dhatu mala in their normal and abnormal states, Dhatu Samya is arogya (health) and Dhatu Vaisamya is roga (disease), methods of maintenance of dhatu samya (svastha vrtta), properties and functions of Ausadha (drugs) anna (articles of food); and Vihara (activities), doctrine of Rasa-guna-virya-vipaka-prabhava; ahara paka and dhatu utpatti - (digestion of food and formation of tissues-metabolism) primary causes of diseases - Rogabheda (kinds of diseases), cikitsa bheda (kinds of therapies such as Panchakarma (five purificatory therapies) and many other topics - these pertaining to anatomy, physiology, materia medica, pharmacology, pathology and therapeuties - which are the essential subjects of medical science are included in this book. With the adoption of these doctrines only Ayurveda became a true science. Caraka Samhita represents one important branch of Ayurveda known as Kaya Cikitsa (inner medicine). Other seven branches also adopt these doctrines only. This has made Caraka Samhita, a source book for all. In view of its importance and popularity, many scholars have written commentaries on it. Many of these are lost and among the available ones, the commentary of Cakrapani Datta known as Ayurveda Dipika is considered the best. Hence its translation and inclusion in this book. Prof. K.R. Srikantha Murthy has experience of teaching all subjects of Ayurveda and also experience of translating many books of Ayurveda into English. So most suited for the translation of this important book. Prof. K.R. Srikanthamurthy (b. 1929) is an alumnus of Govt. Ayurveda College, Mysore (1948) and Post-Graduate Centre, Jamnagar (1958), now known as Gujarat Ayurveda University. He has served as Professor and Principal of all the three Govt. Colleges of Ayurveda in Karnataka and Govt. Unani Medical College, Bangalore, Retired from service in 1984. Has served as Research Officer at Govt. Ayurveda College, Mysore and recently as National Professor of Vagbhata (1997-1999). He has been continuously engaged in teaching and literary pursuit since last fifty years, author of many books and scores of scientific monographs. He has translated into English many ancient books such as Astanga hrdaya, Astanga Sangraha, Madhava nidana, Saranga dhara Samhita, Bhavaprakasa and Susruta samhita is the latest in the series of his translations.